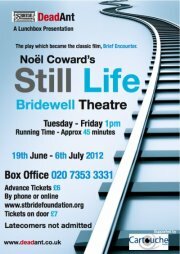 The Lunchbox Theatre programme of the Bridewell Theatre is one that taps into the roots of the St Bride Foundation. Established in the 1890’s, the Foundation Institute was created at the crossroads where the Church’s traditional notion of charity met the more enlightened of the Victorian patriarchs. Across London’s East End we see similar projects being set up, and a core function was not just the improvement of physical and material wealth but the improvement of the soul. Lectures on subjects that often took ideas such as the role of the pastoral in Shakespeare or the glories of classical Greece were given frequently to the working poor of London. You would be hard pressed to argue that the Bridewell Theatre, based at the junction of Fleet Street and Farringdon Street, still caters to the working poor. From the road you can look east and see office blocks that tower over St Paul’s and obscures all of Cheapside. It might, however, still be argued that the workers of London’s financial heartland might benefit from the Victorian ideals of mental nourishment. If so one hopes that they make use of Lunchbox Theatre to catch Noel Coward’s Still Life. At 45 minutes it acts as an exemplar of the one act structure and hopefully might rehabilitate some attitudes towards Coward. His prodigious output and general position as whipping boy for the angry young men of the 1960’s has perhaps obscured the incredible talent that enabled him to become a colossus of pre-1945 British theatre. He writes, and is reflective of, a very specific period in Britain’s history – which bisects the Victorian and modern worlds – where the class upheaval put in motion after the disasters of World War 1 had challenged the rights of the upper classes to lead and the church to provide moral guidance. During this period of flux the culture of high society refused to seriously engage with the questions raised of the pre-existing order; Coward is no exception to this and a number of his works probably cannot be revived due to the nature of the elitism and class-caricatures contained in the text. However Still Life suggests that he was aware of the changing pressures and the way that the upper-classes were trapped within the systems created by their own class (and one cannot but think that own sexuality was no doubt an underlying issue). The abiding impression for the audience is that whilst the play focuses on the relationship between Laura and Alec, it is the relationship of Myrtle and Albert that is allowed to be alive. It is arguable that in this Coward moves perilously close to suggesting the idea of the noble savage free to express their baser instincts, but in many ways the relationship could be closer to Shakespeare’s Phebe and Silvius from As You Like It – providing a comic background and emotional relief from the play’s driving relationship. Still Life was famously adapted to the screen as Brief Encounter, and Celia Johnson and Trevor Howard were forever immortalised as the epitome of that very British type of love affair: all lingering looks and stiff upper lips. To walk in these shadows requires actors capable of working through what might otherwise appear on the verge of self-parody. Alice Knapton (Laura) and James Powell (Alec) are not always given a lot to work with in the text and there is a risk that performances will come across as one-note and slightly glassy. However they manage to sidestep this trap and bring a multi-layered texture to the roles that hints at all that lies beneath. There is a convincing dynamism in the relationship that suggests a desperate and tragic knowledge that a life lived through social strictures is a life without escape. This is embodied in two excellently captured moments in the play; the discussion on medical conditions that completely fails to stop the burgeoning sexual chemistry of the pair. For the first time in the play Laura becomes completely alive and Knapton and Powell manage to evoke the inevitability that hangs over the characters and the way they are unable to even steer their conversation to safer territory. The second is Coward’s tragic reversal of the traditional deus ex machine; the inopportune arrival of Dolly (Cathy Conneff). The thwarted farewell is possibly Coward’s finest moment and equals Terence Rattigan for exquisitely crafted tragedy. The key to any production is how this moment is handled and the abiding image is the small squeeze that Alec gives Laura’s shoulder whilst standing impotently in the knowledge that Dolly has precluded all else. It is a very small gesture but in a play where the unsaid is all it carries a great emotional punch. James Williams, the director, has created a convincing world out of the Bridewell’s limited space, and manages to create a central space for Laura and Alec’s relationship whilst still allowing the Myrtle/Albert and Beryl/Stanley counterpoints room to breathe. Credit must go to the support cast, particularly Jean Perkins (Myrtle) and Anthony Wise (Albert), as the roles, whilst comic, shouldn’t be treated as comic roles because they provide a crucial balance and any attempt to play to the gallery would risk upstaging the central characters. The Bridewell’s Lunchbox Theatre programme has been running since 2005 and is the kind of scheme that should be successful – there must be no end of theatre-hungry workers in the area – and it is to be hoped, if productions match the quality of Still Lives, it will continue to grow.